We offer a full line of tires and tire services. Capital Car Care of Fredericksburg ensures proper mounting of your new tires using state-of-the-art tire mounting equipment—equipment designed to handle almost all tire and rim combinations. Most manufacturers recommend that tires should be rotated on a scheduled basis at approximately 5,000 to 8,000 mile intervals. Capital Car Care of Fredericksburg can help you get maximum life from your tire investment. Flat tires can happen anytime. When they occur the tire should be dismounted and closely inspected inside and out for any possible damage. Punctures up to 1/4-inch diameter in the tread area can be safely repaired using industry-approved methods. Tires with punctures larger than 1/4-inch diameter or sidewall damage must be replaced. Capital Car Care of Fredericksburg can provide any original equipment steel wheel to match your vehicle. 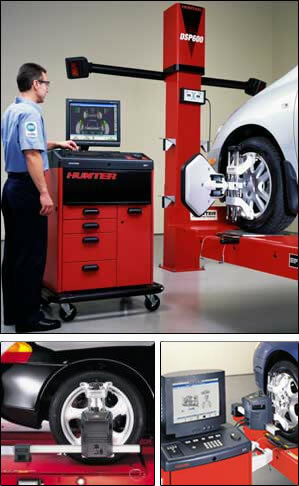 Professional mounting and balancing is available for most tire and wheel combinations. Capital Car Care of Fredericksburg has custom wheels available to help you customize any vehicle. With our specialized tire and wheel mounting equipment we will correctly install most custom rim and tire applications. * Premium wheel balance entitles you to wheel balance service at no extra charge every 5,000 miles or whenever needed. This lifetime warranty only applies to you-the original owner/purchaser-and the original tires identified on the customer invoice for as long you own the tires. Our state-of-the-art four wheel laser alignment process will ensure your vehicle drives safely and properly. A proper alignment will also ensure you get the most miles out of your tires, and it will get you further on a tank of gas, saving you money!